Time has flown by so fast, suddenly it's over 60 days since I last posted. Have I ever lagged that much before? It seems like I just posted! Lots happening, I've been super busy, the temps are in the 90s to 100s in Elephant Butte, NM where I'm camped, and things have finally settled down a bit. It's still hot, but honestly after a while you get acclimated to the high temperatures. It just slows me down a bit! 1. I'm now a New Mexico Resident! I've been wanting to leave California since I got on the road over seven years ago, but I didn't know where I wanted to land. I love Arizona and New Mexico and it was a hard decision to make. Now that all the paperwork is done, I have a New Mexico Driver License, The Palms is licensed and insured in NM, and my Medicare stuff has been transferred and all THAT paperwork is done, I think I made the right decision. Transferring residency is different depending on the states, I imagine, but since I've gone through it here I'm going to do a separate post letting you know what is needed to get it done. It's really fairly easy, but time consuming. 2. Our cabin door lock broke, and I couldn't get the door open! I called Chip Baker of Baker's RV Service, who is highly recommended and very good at all things RV. He came over and looked at it and said he'd never seen this before. 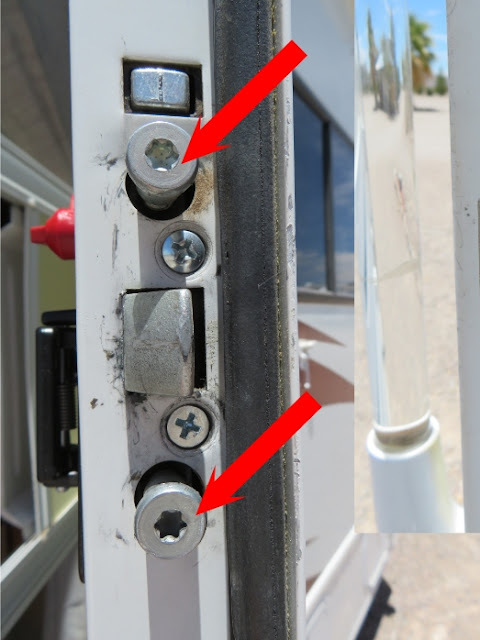 He finally got the inside plate of the lock off and we could see the broken piece, but he couldn't release the lock to get the door open. He thought he could do it with other tools he didn't have with him that day. I told him I'd order the lock on-line and call him when it came in, so he could come back and fix it. Of course a few days passed before the lock arrived, and when I called Chip, he was booked for another three days. I am very lucky that I have a Class C so Katie and I could get in and out of the rig through the driver door, but that's such a pain. I didn't want to wait another three days so I called another RV repair guy, Dave of RV Mobile Repairs and he was also booked the next three days. We're lucky to have two different Mobile Repair companies here in Elephant Butte who are highly recommended and know what they're doing. They are also priced low to moderate from what I've seen. I've been very happy with both Dave and Chip when they've come out to repair things for me on The Palms. Next I asked a man here in the park, Max, if he would mind looking at it. 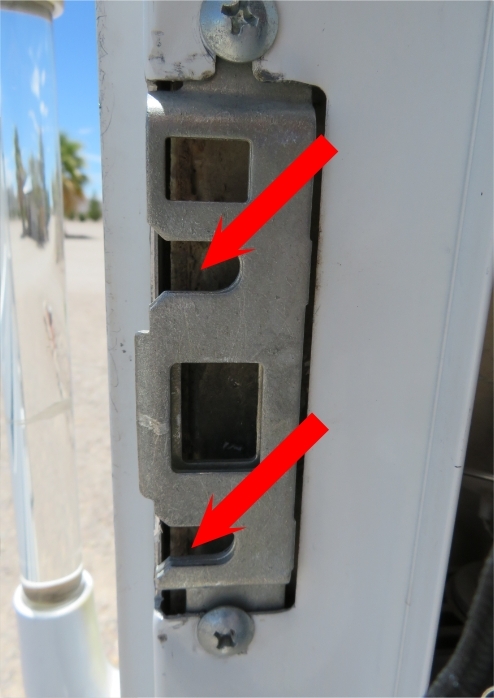 One of the problems is that the outside plate of the door, the part with the locking mechanisms, was solidly stuck. Max tried this and that, got more tools, and he managed to get the rest of the lock out! Whew, that was a relief! Then getting the new lock in was not an exact fit, even though I paid more than $125 over the Amazon.com locks that were comparable to my old lock. I went right to the manufacturer and she said their locks cost more because it was an exact fit to the old lock, which was no longer made. Well, that wasn't necessarily true! But Max was able to work around the issues and get everything to fit, securely in place, screwed in, and it worked! YAAAAY! I'm kind of amazed watching these guys with mechanical know-how and lots of experience working around problems - the way their minds work is an amazing thing. I was really impressed. A BIG THANK YOU TO MAX!!! He wouldn't even take a glass of cold water on a hot day, he insisted he didn't need a thing. He said he was happy to see how these locks worked, then if his rig had the same problem, he'd know what to do. What a guy! You don't really appreciate that door until you can't get it open! 3. Katie has been sick! From that point on she's had problems. She only vomited one other time but we're having a problem getting the diarrhea under control. She literally leaked when she would sit or lie down. You can imagine the mess that makes. She was SO GOOD accepting that she couldn't go past the barriers - but of course, I was "high stepping it" every time I moved around The Palms. A real PAIN! Finally I was so tired, I just told her to poop on the floor. I was too tired to get up and the floor needed cleaning every morning anyway, so... I needed to sleep. Those first days I'd wake up, get her outside and we'd walk till she was done "pooping" and then return to The Palms. The second thing each morning was cleaning up - I'd be on my knees with the spray bottle sanitizing the floor with two or three passes, then I'd take her bed and blankets outside and clean them, then lay them out to dry. Then I'd fill a plastic tub with warm water from my outside shower and clean Katie up. She wouldn't let me clean her poopy body parts and yelped like crazy if I went anywhere near her tail, so I had her sitting in the warm clean water, then showered her off. What a deal, huh? Katie always seemed to like it, though, so I was able to get her pretty clean each time. I went to town and bought some small cheap blankets and another dog bed. I just couldn't keep up with the mess! Luckily there's a laundromat in the RV park we're in, and when I had a load, I'd take it over and run them through the washer/drier. That went on for four days. In addition to on-line research I had called the vet and was given suggestions on what to feed her to get the diarrhea under control, and after four calls to the vet I went by and picked up some meds for Katie. She was still eating and drinking and acting normally, so that was good. The first Rx didn't work, and it should have worked by the next afternoon, so I went back to the vet and got another dose as well as an antibiotic. The next morning things started getting better. This is Kitchen Jail, Phase 2. I removed one layer of the barrier to make it easier on myself and she still didn't try to jump over. She's such a good girl. I did put up the windshield barrier at night, though. Just in case. We're not back to normal and it's been over two weeks. But we're getting there. I'm still feeding Katie the white rice/bland chicken meals along with bananas, canned pumpkin, cut up baked potatoes, things like that that she can have and are easy on her stomach. And I'm introducing her regular food back into her diet very slowly. She really prefers the home made meals at this point. I went to the vet yesterday to pick up more prescription food, which she eats now for her heart/kidney issues, and weighed her, and she's lost one pound since this started. She actually needed to lose that pound, but you don't want to lose weight because you're sick. I also got her a canine probiotic kit that has a capsule you break and sprinkle the contents on her food, and a paste also that helps firm the stool. If it was a bug that the antibiotic knocked out, the probiotic will get her little tummy back in a good healthy condition. Katie is out of kitchen jail now, but I'm not letting her sleep up in my bed. This is a good time for her to sleep "down" anyway because of the heat. We're both more comfortable, I think. So, Katie is on the mend. Have any of you had an issue like this with your pets? I've never had a dog that went through this. I couldn't think of anything else to do to help her - did I miss something that would have gotten her better quicker? 4. Guess what? My door wouldn't open again yesterday! Max said he'd come right over and look at it and get it working... It was so hot, I told him to wait till late afternoon or the next morning or late afternoon, no hurry because I didn't mind using the truck driver door. 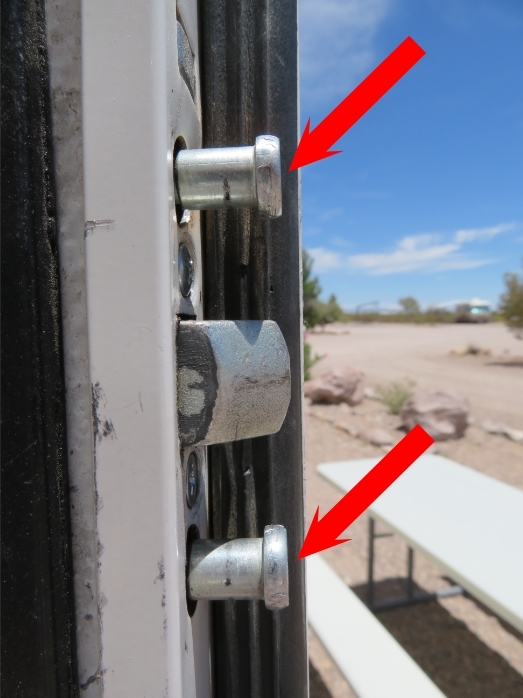 You know - lots of RVers only HAVE ONE DOOR! Thank goodness I'm driving a Class C with the two truck doors! Otherwise Katie and I would have been climbing in and out of a WINDOW till the new lock came in the mail, and again when the door wouldn't open the second time. That afternoon I thought I'd at least start the process and save Max some time, and took out the screws of the inner plate and tried turning the locks and playing with the parts and WaaLaa, the door opened! I couldn't believe it! So I screwed the inner lock plate back on and stood outside trying to figure out what was happening. As I was closing the door slowly, it seemed to be harder than normal to close it, something was catching and I noticed the two metal thingies - I don't know what they are called - seemed longer than they had before. These two metal, round things attached to the door itself, not part of the lock. They fit into the door jamb plate when the door is closed. I've read that they shouldn't be messed with - if there's a problem, call a professional locksmith. Now I know why: you could lock yourself out of your rig. I noticed they were loose and extending out further than they should, so if I slammed the door, they would have gone past where they should be and the door would be stuck again. (Or something like that.) So I got my screwdriver and tried different lengths to see what worked. Finally they were at a place where they went securely where they should be without catching on that metal plate and there was no problem getting the door closed or open. That was a good lesson, I know more about these locks than I ever thought I would need! But if I ever feel that little feeling where the door isn't closing easily, that little "catch" and a metallic sound - I won't close it. I'll check those two round things to see if they are positioned correctly first. Well, it sure sounds like my life has been horrible, but other than Katie being sick, I'm happy as a clam as usual. You all know we have things pop up from time to time and we just have to take care of them then life is wonderful again. It's only frustrating if the fix isn't easy. Right? But I have a new job which I'm loving, and I'm really enjoying being a New Mexico resident. I'll post about those next time and I also want to tell you about my new Medicare plan here in NM. I freaking couldn't believe how good it is! Check back soon, I'm in a writing mood and might just write the next post to publish in a few days! I have a list of nine things to post over the next week or so. Oh, also - and this is a BIGGIE! I don't know if I have an ANGEL, or lots of ANGELS, but as you probably know, I'm an Amazon Affiliate. I have links here on my posts that will bring readers to Amazon.com to browse around and make any purchases they want/need. Whenever someone buys something from Amazon.com after using my links to get there for their first search for that item, I get a small percentage of the sale. It's not more expensive for the buyer, Amazon takes a bit from their profit and gives that $$ to it's affiliate. Win/Win for you and me, because it's easy for my readers to get there through my links, whether they buy something or not, and then I earn some money through their purchase. Normally my proceeds aren't very high except sometimes around the Christmas season, but I just checked this morning and SOMEONE or a bunch of SOMEONES have been making a lot of purchases through my links! WOW! !